Italic In the 'Name' column, denotes astronauts who have flown to the Moon without landing. Bold In the 'Name' column, denotes astronauts who have walked on the Moon. Bold italic In the 'Name' column, denotes astronauts who have walked on the Moon and who have also flown to the Moon without landing. Strikethrough Denotes those whose first spaceflight had begun and was intended to cross the Kármán line, but failed to do so. * In the 'Name' column, denotes those who flew above the US definition of space, but did not exceed the Kármán line. Yuri Gagarin, the first person in space. Alan Shepard, the first American and the second person in space. 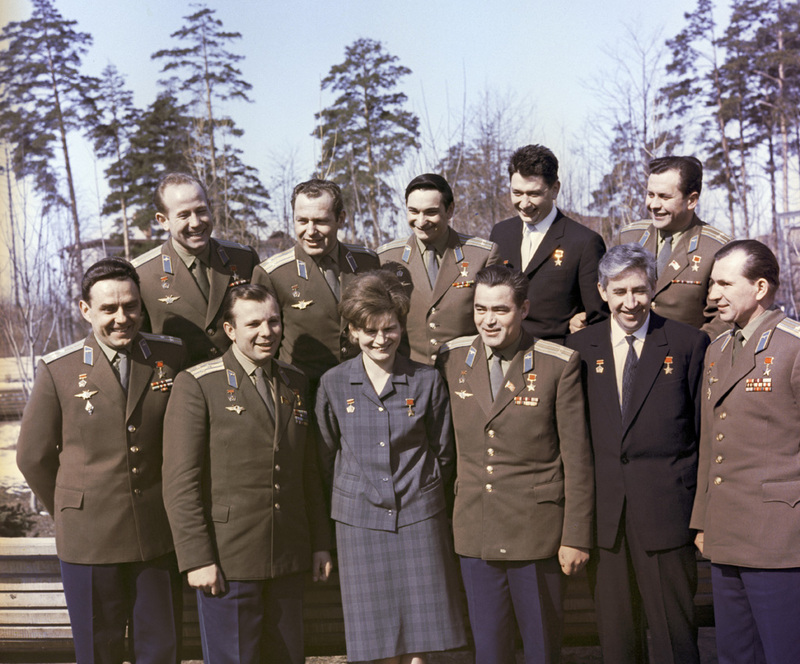 Valentina Tereshkova, the first woman and 12th person in space. 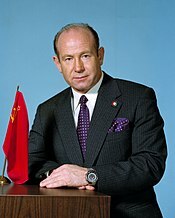 Alexei Leonov, joint 17th in space and first to perform an EVA. 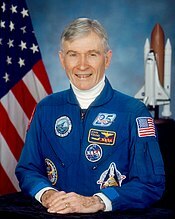 John Young, 19th person in space, first to fly solo around the Moon and first to command a Space Shuttle. Vladimir Komarov, joint 14th person and first to die during spaceflight (during Soyuz 1). 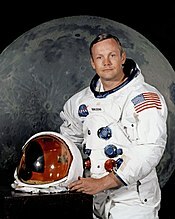 Neil Armstrong, 26th person in space and first to set foot on the Moon. Harrison Schmitt, joint 59th person in space. The most recent person and first geologist to have arrived on the Moon. Vladimír Remek, 88th person in space and the first from a country other than the US or the Soviet Union. Sigmund Jähn, 91st person in space and the first German. Phạm Tuân, 97th person in space, and the first from an Asian country (Vietnam). Robert Crippen, 103rd person in space and the first to pilot a Space Shuttle from space. Story Musgrave, joint 116th person in space and the only person to have flown on all five NASA Space Shuttles. Sally Ride, joint 120th person and the first American woman in space. Guion Bluford, joint 125th person and the first African American in space. Bruce McCandless, joint 133rd person in space and the first to perform an untethered EVA. Rakesh Sharma, 139th person and the first Indian in space. Anna Lee Fisher, joint 155th person and the first mother in space. Sultan bin Salman Al Saud, joint 170th person, first royal, and first Saudi Arabian in space. 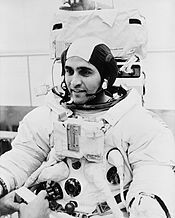 Rodolfo Neri Vela, joint 192nd and first Mexican in space. 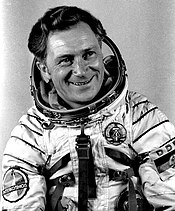 Anatoly Solovyev, joint 206th person in space and the person to have the most time in EVA, as of 2014. Sergei Krikalev, 210th person and the person to have spent the most total time in space, as of 2014. William Shepherd, joint 211th person in space and the first commander of the ISS. Toyohiro Akiyama, joint 239th person, first Japanese in space, and the first commercially organised astronaut of a government space program. Helen Sharman, joint 249th and first British astronaut. Dirk Frimout, joint 268th and first Belgian to go into space. 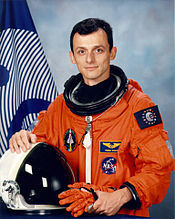 Franco Malerba, joint 277th and first Italian to go into space. Claude Nicollier, joint 277th and first Swiss to go into space. Mae Jemison, joint 280th person and first African American woman to go into space. 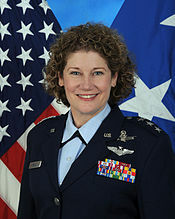 Susan Helms, joint 286th person in space and first woman to serve on board the ISS. Yuri Malenchenko, joint 309th person in space and first to marry in space. Chiaki Mukai, joint 311th person and first Japanese woman in space. 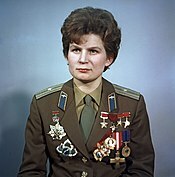 Yelena Kondakova, 318th person in space and first woman to make a long-duration spaceflight. 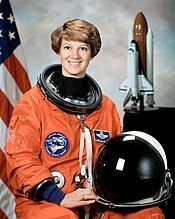 Eileen Collins, the 322nd person in space, first female commander and first female pilot of a Space Shuttle. Koichi Wakata, joint 339th person in space and first Japanese commander of the ISS. 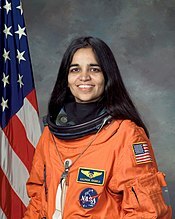 Kalpana Chawla, joint 366th person, first Indian American astronaut and first Indian woman in space. 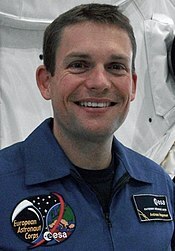 Pedro Duque, 384th person in space and first Spanish national. 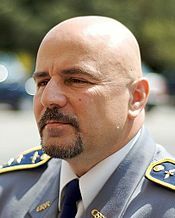 Ivan Bella, 386th person and first Slovak in space. 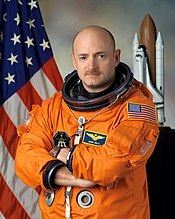 Scott Kelly (astronaut), 391st person and first of the first two identical twin brothers to go into space. Dennis Tito, the 404th person in space and the first space tourist. Mark Kelly, the 409th person in space, and the second of the first two identical twin brothers to go into space. 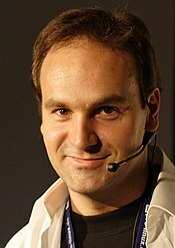 Mark Shuttleworth, 416th person in space and the first from an independent African country (South Africa). 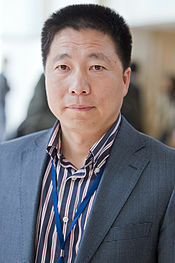 Yang Liwei, the 432nd person in space and the first of the Chinese space program. 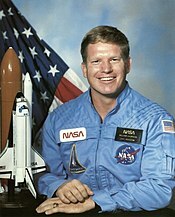 Mike Melvill, the 435th person in space and the first commercial astronaut of a privately flown and funded spaceflight. 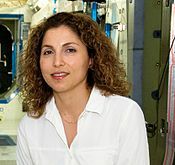 Anousheh Ansari, the 449th person in space, first female space tourist and the first Iranian in space. 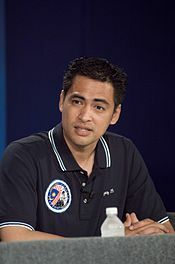 Sheikh Muszaphar Shukor, joint 464th person and the first person from Malaysia to go into space. Yi So-yeon, joint 475th person and the first Korean in space. 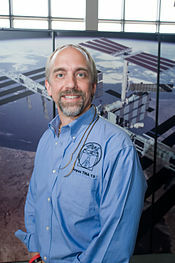 Richard Garriott, 486th person in space and first second-generation American to go into space. Nicole Stott, joint 503rd person in space and the first to use Twitter live from orbit. 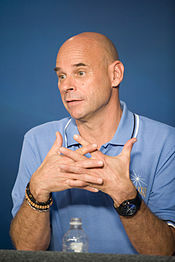 Guy Laliberté, joint 506th person in space and the first Canadian space tourist. Robert Satcher, joint 508th person and the first orthopedic surgeon in space. 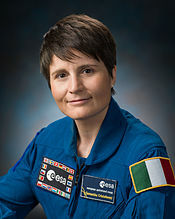 Samantha Cristoforetti, 541st person in space, who has performed the longest single spaceflight by a woman, as of 2015. Andreas Mogensen, joint 544th person and the first Dane in space. ^ a b Fatalities which occurred during training or testing are not included in this list, but can be found in the list of spaceflight-related accidents and incidents. ^ Vladimir Komarov died during Soyuz 1. ^ a b c Soyuz 11 capsule depressurised in orbit. ^ a b c d e f g See the Space Shuttle Challenger disaster. ^ Michael Foale is a dual national of the United States and the United Kingdom, but flew under the United States flag. ^ a b c d e f g See the Space Shuttle Columbia disaster. ^ Anousheh Ansari is a dual national of the United States and Iran, but flew under the United States flag. ^ Soyuz MS-10 booster failed several minutes after launch, and achieved sub-orbital spaceflight only according to the USAF definition, from the 1960s, of 80 km (50 mi). The flight reached an altitude of 93 km (58 mi), not high enough to meet the official FAI criterion of 100 km (62 mi), before the crew landed safely. ^ Taylor Redd, Nola (24 July 2012). "Yuri Gagarin: First Man in Space". Space.com. Retrieved 16 December 2017. ^ "First man in space". History.com. Retrieved 16 December 2017. ^ "May 5, 1961, Alan Shepard in Spacesuit Before Mercury Launch". NASA. 5 May 2016. Retrieved 16 December 2017. ^ Taylor Redd, Nola (5 May 2014). "Alan Shepard: First American in Space". Space.com. Retrieved 16 December 2017. ^ White, Mary C. "Detailed Biographies of Apollo I Crew - Gus Grissom". NASA History. Retrieved 16 December 2017. ^ Howell, Elizabeth (28 January 2014). "Gus Grissom: 2nd American in Space". Space.com. Retrieved 16 December 2017. ^ "1961: Russian cosmonaut spends day in space". BBC. Retrieved 16 December 2017. ^ "Liftoff of John Glenn's Friendship 7, Feb. 20, 1962". NASA. 30 November 2016. Retrieved 16 December 2017. ^ "Glenn Orbits the Earth". NASA. 16 February 2012. Retrieved 16 December 2017. ^ "May 24, 1962 - Scott Carpenter on the Way to Mercury-Atlas 7 Launch Site". NASA. 24 May 2017. Retrieved 16 December 2017. ^ a b "Joint flight of Vostok-3 and Vostok-4". Russian Space Web. Retrieved 16 December 2017. ^ "Vostok 3". Spacefacts. Retrieved 16 December 2017. ^ "Vostok 4". Spacefacts. Retrieved 16 December 2017. ^ "Mercury 8". Spacefacts. Retrieved 16 December 2017. ^ "Mercury 9". Spacefacts. Retrieved 16 December 2017. ^ "Vostok 5". Spacefacts. Retrieved 16 December 2017. ^ "Vostok 6". Spacefacts. Retrieved 16 December 2017. ^ "Appendix A: X-15 Flight Log". NASA. Retrieved 18 December 2017. ^ a b c "Voskhod". Spacefacts. Retrieved 16 December 2017. ^ a b "Voskhod 2". Spacefacts. Retrieved 16 December 2017. ^ "Gemini 3". Spacefacts. Retrieved 18 December 2017. ^ a b "Gemini 4". Spacefacts. Retrieved 18 December 2017. ^ "Gemini 5". Spacefacts. Retrieved 18 December 2017. ^ a b "Gemini 7". Spacefacts. Retrieved 18 December 2017. ^ "Gemini 6A". Spacefacts. Retrieved 18 December 2017. ^ a b "Gemini 8". Spacefacts. Retrieved 18 December 2017. ^ "Gemini 9A". Spacefacts. Retrieved 18 December 2017. ^ "Gemini 10". Spacefacts. Retrieved 18 December 2017. ^ "Gemini 11". Spacefacts. Retrieved 18 December 2017. ^ "Gemini 12". Spacefacts. Retrieved 18 December 2017. ^ a b "Apollo 7". Spacefacts. Retrieved 18 December 2017. ^ "Soyuz 3". Spacefacts. Retrieved 16 December 2017. ^ "Apollo 8". Spacefacts. Retrieved 18 December 2017. ^ "Soyuz 4". Spacefacts. Retrieved 16 December 2017. ^ a b c "Soyuz 5". Spacefacts. Retrieved 16 December 2017. ^ "Apollo 9". Spacefacts. Retrieved 18 December 2017. ^ a b "Soyuz 6". Spacefacts. Retrieved 16 December 2017. ^ a b c "Soyuz 7". Spacefacts. Retrieved 16 December 2017. ^ "Apollo 12". Spacefacts. Retrieved 18 December 2017. ^ a b "Apollo 13". Spacefacts. Retrieved 18 December 2017. ^ "Soyuz 9". Spacefacts. Retrieved 17 December 2017. ^ a b "Apollo 14". Spacefacts. Retrieved 18 December 2017. ^ "Soyuz 10". Spacefacts. Retrieved 17 December 2017. ^ a b "Soyuz 11". Spacefacts. Retrieved 17 December 2017. ^ a b "Apollo 15". Spacefacts. Retrieved 18 December 2017. ^ a b "Apollo 16". Spacefacts. Retrieved 18 December 2017. ^ a b "Apollo 17". Spacefacts. Retrieved 18 December 2017. ^ a b "Skylab 2". Spacefacts. Retrieved 18 December 2017. ^ a b "Skylab 3". Spacefacts. Retrieved 18 December 2017. ^ a b "Soyuz 12". Spacefacts. Retrieved 17 December 2017. ^ a b c "Skylab 4". Spacefacts. Retrieved 18 December 2017. ^ a b "Soyuz 13". Spacefacts. Retrieved 17 December 2017. ^ "Soyuz 14". Spacefacts. Retrieved 17 December 2017. ^ a b "Soyuz 15". Spacefacts. Retrieved 17 December 2017. ^ a b "Soyuz 17". Spacefacts. Retrieved 17 December 2017. ^ a b "ASTP". Spacefacts. Retrieved 18 December 2017. ^ "Soyuz 21". Spacefacts. Retrieved 17 December 2017. ^ "Soyuz 22". Spacefacts. Retrieved 17 December 2017. ^ a b "Soyuz 23". Spacefacts. Retrieved 17 December 2017. ^ "Soyuz 24". Spacefacts. Retrieved 17 December 2017. ^ a b "Soyuz 25". Spacefacts. Retrieved 17 December 2017. ^ "Soyuz 26". Spacefacts. Retrieved 17 December 2017. ^ "Soyuz 27". Spacefacts. Retrieved 17 December 2017. ^ "Soyuz 28". Spacefacts. Retrieved 17 December 2017. ^ "Soyuz 29". Spacefacts. Retrieved 17 December 2017. ^ "Soyuz 30". Spacefacts. Retrieved 17 December 2017. ^ "Soyuz 31". Spacefacts. Retrieved 17 December 2017. ^ "Soyuz 32". Spacefacts. Retrieved 17 December 2017. ^ "Soyuz 33". Spacefacts. Retrieved 17 December 2017. ^ "Soyuz 35". Spacefacts. Retrieved 17 December 2017. ^ "Soyuz 36". Spacefacts. Retrieved 17 December 2017. ^ "Soyuz T-2". Spacefacts. Retrieved 17 December 2017. ^ "Soyuz 37". Spacefacts. Retrieved 17 December 2017. ^ "Soyuz 38". Spacefacts. Retrieved 17 December 2017. ^ a b "Soyuz T-3". Spacefacts. Retrieved 17 December 2017. ^ "Soyuz T-4". Spacefacts. Retrieved 17 December 2017. ^ "Soyuz 39". Spacefacts. Retrieved 17 December 2017. ^ "STS-1". Spacefacts. Retrieved 18 December 2017. ^ "STS-1 History". NASA. Retrieved 18 December 2017. ^ "Soyuz 40". Spacefacts. Retrieved 17 December 2017. ^ a b "STS-2". Spacefacts. Retrieved 18 December 2017. ^ "STS-3". Spacefacts. Retrieved 18 December 2017. ^ "Soyuz T-5". Spacefacts. Retrieved 17 December 2017. ^ "Soyuz T-6". Spacefacts. Retrieved 17 December 2017. ^ "STS-4". Spacefacts. Retrieved 18 December 2017. ^ a b "Soyuz T-7". Spacefacts. Retrieved 17 December 2017. ^ a b c "STS-5". Spacefacts. Retrieved 18 December 2017. ^ a b c "STS-6". Spacefacts. Retrieved 18 December 2017. ^ "Soyuz T-8". Spacefacts. Retrieved 17 December 2017. ^ a b c d "STS-7". Spacefacts. Retrieved 18 December 2017. ^ "Soyuz T-9". Spacefacts. Retrieved 17 December 2017. ^ a b c d "STS-8". Spacefacts. Retrieved 18 December 2017. ^ a b c d "STS-9". Spacefacts. Retrieved 18 December 2017. ^ a b c d "STS-41B". Spacefacts. Retrieved 18 December 2017. ^ a b "Soyuz T-10". Spacefacts. Retrieved 17 December 2017. ^ "Soyuz T-11". Spacefacts. Retrieved 17 December 2017. ^ a b c d "STS-41C". Spacefacts. Retrieved 18 December 2017. ^ "Soyuz T-12". Spacefacts. Retrieved 17 December 2017. ^ a b c d e "STS-41D". Spacefacts. Retrieved 18 December 2017. ^ a b c d e "STS-41G". Spacefacts. Retrieved 18 December 2017. ^ a b "STS-51A". Spacefacts. Retrieved 18 December 2017. ^ a b c d "STS-51C". Spacefacts. Retrieved 18 December 2017. ^ a b c d e "STS-51D". Spacefacts. Retrieved 18 December 2017. ^ a b c d "STS-51B". Spacefacts. Retrieved 18 December 2017. ^ a b c d e "STS-51G". Spacefacts. Retrieved 18 December 2017. ^ a b c d e "STS-51F". Spacefacts. Retrieved 18 December 2017. ^ a b c "STS-51I". Spacefacts. Retrieved 18 December 2017. ^ a b "Soyuz T-14". Spacefacts. Retrieved 17 December 2017. ^ a b c "STS-51J". Spacefacts. Retrieved 18 December 2017. ^ a b c d "STS-61A". Spacefacts. Retrieved 18 December 2017. ^ a b c d e "STS-61B". Spacefacts. Retrieved 18 December 2017. ^ a b c d "STS-61C". Spacefacts. Retrieved 18 December 2017. ^ "Michael J. Smith (Captain, USN)". NASA. Retrieved 18 December 2017. ^ "Gregory B. Jarvis (Mr.)". NASA. Retrieved 18 December 2017. ^ "S. Christa Corrigan McAuliffe". NASA. Retrieved 18 December 2017. ^ "Soyuz TM-2". Spacefacts. Retrieved 17 December 2017. ^ a b "Soyuz TM-3". Spacefacts. Retrieved 17 December 2017. ^ a b "Soyuz TM-4". Spacefacts. Retrieved 17 December 2017. ^ a b "Soyuz TM-5". Spacefacts. Retrieved 17 December 2017. ^ a b "Soyuz TM-6". Spacefacts. Retrieved 17 December 2017. ^ "Soyuz TM-7". Spacefacts. Retrieved 17 December 2017. ^ a b "STS-27". Spacefacts. Retrieved 18 December 2017. ^ a b c "STS-29". Spacefacts. Retrieved 18 December 2017. ^ "STS-30". Spacefacts. Retrieved 18 December 2017. ^ a b c "STS-28". Spacefacts. Retrieved 18 December 2017. ^ a b "STS-34". Spacefacts. Retrieved 18 December 2017. ^ a b "STS-33". Spacefacts. Retrieved 18 December 2017. ^ a b c "STS-32". Spacefacts. Retrieved 18 December 2017. ^ "Soyuz TM-9". Spacefacts. Retrieved 17 December 2017. ^ a b "STS-36". Spacefacts. Retrieved 18 December 2017. ^ "Soyuz TM-10". Spacefacts. Retrieved 17 December 2017. ^ a b c "STS-41". Spacefacts. Retrieved 18 December 2017. ^ a b c "STS-38". Spacefacts. Retrieved 18 December 2017. ^ a b "STS-35". Spacefacts. Retrieved 18 December 2017. ^ a b "Soyuz TM-11". Spacefacts. Retrieved 17 December 2017. ^ a b c "STS-37". Spacefacts. Retrieved 18 December 2017. ^ a b c d e "STS-39". Spacefacts. Retrieved 18 December 2017. ^ a b "Soyuz TM-12". Spacefacts. Retrieved 17 December 2017. ^ a b c d "STS-40". Spacefacts. Retrieved 18 December 2017. ^ "STS-43". Spacefacts. Retrieved 18 December 2017.